Kurt Heyer – RHP – Arizona – So. 7.1IP 6H 4ER 3BB 6K. (W, 6-1). Heyer adds a win over preseason #2 UCLA to his impressive resume. Andrew Triggs – RHP – USC – Jr. 6.2IP 6H 2ER 2BB 9K. Sam Gaviglio – RHP – Oregon State – Jr. 8IP 4H 0ER 2BB 8K. (W, 7-1). Another impressive win for Gaviglio and the Beavers. This time against Stanford. Sonny Gray – RHP – Vanderbilt – Jr. 7.2IP 11H 3ER 1BB 7K. (L, 7-2). Hudson Randall – RHP – Florida – So. 6.1IP 6H 2ER 1BB 1K. (W, 6-1). Matt Price – RHP – South Carolina – So. 1.1IP 0H 0ER 0BB 4K. (S, 11). Best closer in the nation closes out huge win over Vanderbilt. Kurt McCune – RHP – LSU – Fr. 5IP 4H 5ER 3BB 3K. (L, 5-2). Taylor Jungmann – RHP – Texas – Jr. 7IP 8H 1ER 1BB 8K. (W, 8-0). 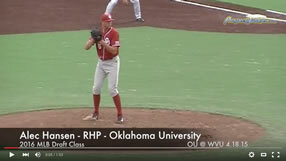 Michael Rocha – RHP – Oklahoma – Sr. 4.2IP 9H 1ER 2BB 6K. 5 unearned runs didn’t help. John Stilson – RHP – Texas A&M – Jr. 8IP 5H 0ER 4BB 7K. (W, 3-1). TJ Walz – RHP – Kansas – Sr. 7IP 5H 1ER 2BB 5K. Patrick Johnson – RHP – UNC – Sr. 4.2IP 5H 1BB 5K. (L, 6-1). Cory Mazzoni – RHP – NC State – Jr. 7IP 4H 4ER 5BB 7K. (W, 3-4). Mark Pope – RHP – Georgia Tech – Jr. 9IP 1H 1ER 2BB 8K. (W, 8-1) Pope’s fantastic season continues. Randy Fontanez – RHP – USF – Sr. 8IP 4H 2ER 1BB 6K. (W, 4-2). Austin Kubitza – RHP – Rice – Fr. 6.1IP 6H 1ER 3BB 7K. Andrew Gagnon – RHP – Long Beach State – Jr. 8IP 1H 0ER 4BB 10K. Ryan Carpenter – LHP – Gonzaga – Jr. 7IP 6H 3ER 2BB 4K. Andrew Chaffin – RHP – Kent St. – So. 8IP 4H 1ER 0BB 13K.